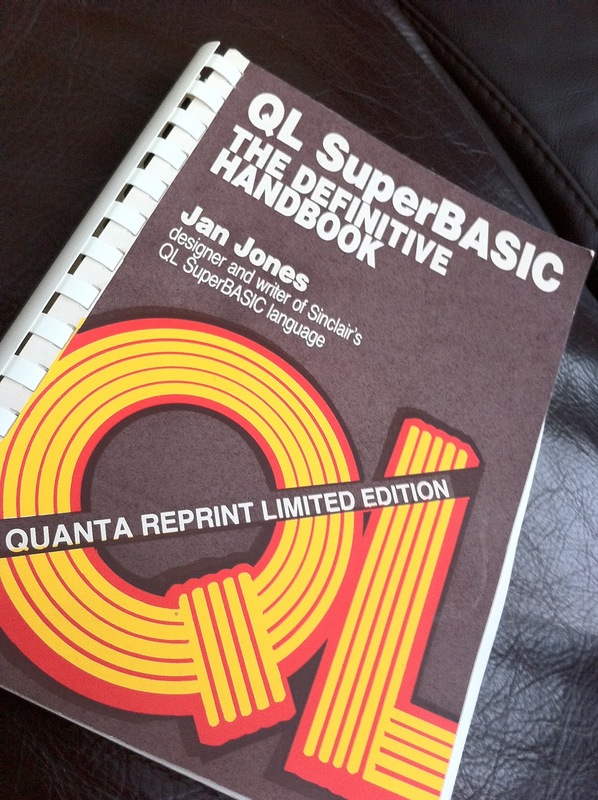 Originally published in 1985 and reprinted by QUANTA in 1989, the book "QL SuperBASIC, The Definitive Handbook" has had much mention in the QL-User list in the past 6 months. As it was referred to with reverence by more than a couple of people I thought if a copy surfaces, then I would get try to obtain it. Well one did, and I did purchase it and for the first time (with regards to technical books) I actually read this from cover to cover over the space of about 5 hours (on a plane) and there were a few things that struck me about it. Chapter 1, "SuperBASIC is a language designed by programmers for programmers", what fantastic statement, it should be the signature or tagline for everyone promoting the QL. The order in which it is written is also for programmers , totally different to the QL User guide, starting with 'Procedures', starting as you should go on in your own programs. Its a really nice book to get to grips with the QL and should be first on everyones shopping list coming back to the QL. I could go on but suffice to say it is that attention to detail in the book that gives it its edge over most others (and this is despite the fact it was written by the the designer of SuperBASIC). If you get the chance of a copy or if Malcolm Lears scanned version sees the light of day, grab it. If you already have a copy then you should already know what I am talking about. Jan makes reference to another Machine Code book about the QL by Colin Opie as being the one to buy, so if anyone knows a copy please let me know.